A pair of security guards tried to stop them, but were threatened with hammers, according to the London Evening Standard. With lookouts stationed outside, the robbers were in the store for less than three minutes and took iPhones, iPads, and Apple Watches. Police were called at 12:42 a.m., and later found two iPhone X units near Kings Cross as well as a moped left in the store. No one has been arrested to date, but detectives are said to be scanning CCTV footage and calling for witnesses. London has been suffering from a rash of similar moped raids. 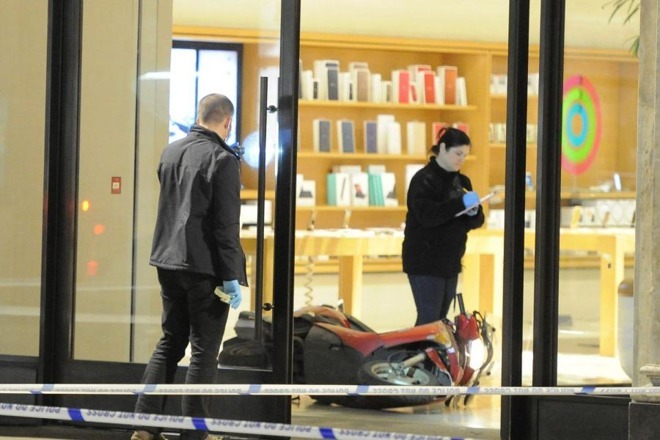 Despite the break-in, Apple Regent Street is now operating as usual. Apple has dealt with a number of smash-and-grabs in recent years. Its stores can be an easy target, given high-cost electronics on open display, and the company's preference for glass facades. Only some locations have bollards and/or retractable security gates. The iPhone X may be especially tempting in light of its scarcity and $999 base pricetag. Earlier this month, thieves stole 313 iPhone X units from a San Francisco delivery truck in the middle of the day.